Every speaker is a student of language, even if it is not our intent. But this is a book for the general student of linguistics. I can't believe I am saying "general" because I've never seen anyone go more into specifics than John McWhorter. He makes a general study of a whole juxtaposition of a variety of languages for the writer who is fascinated by the anthropology of linguistic development. Bear in mind, this book it is rather heavy, and overwhelmingly leaded with obscure trivia. If you are not frightened off by the idea of subconjugations in Ket, and the (illustrations of) grammar and impossibility of figuring out five tenses of Navaho—Verbing may weird English but who knows what it does to Navaho—If you're not scared off, maybe you're potentially an anthropological linguist and this book will be your friend. 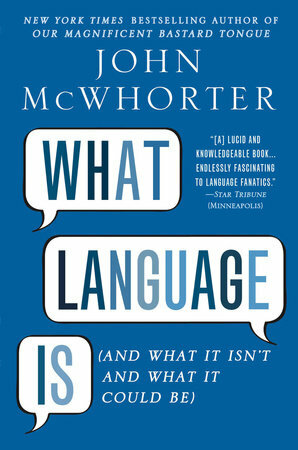 From the beginning, McWhorter rhapsodizes about the peculiarities and idiosyncrasies of Archi, and click languages, and the strange grammatical constructions of obscure tongues almost no one speaks and one would think would be impossible to master. He submerges the reader in characteristics of languages so that we can hardly keep up with all the strange detail. But right at the point when this barrage of detail seems absolutely pointless, he talks about his five signal characteristics of language, (Ingrown, Dissheveled [sic], Intricate, Oral, Mixed). He illustrates with specific detail how languages evolve, how their complexities develop or decline. He also makes a point that when languages are spoken by a few people over time, they become more complex, but when spoken by larger groups for longer time, they get (or stay) dumbed down when influxes of new speakers learn simpler versions of the language. When languages are learned by adults they are dumbed down generationally—as opposed to the small, isolated communities that develop complex languages which can only be learned by children with their aptitude of language. He ranges in topic from the development of classifiers in Chinese and Cantonese, to the number of words for snow in Eskimo, to fetishes in Kikuyu that make it unlearnable to non-native speakers. He examines how an island language lost prefixes and suffixes when foreign adult speakers arrived and imperfectly learned and passed on the language. As an unwritten language, the old version would not, as McWhorter says it, have it's foot in the door. Such developmental hiccups allow the historian a foothold in muddling through the history of language.